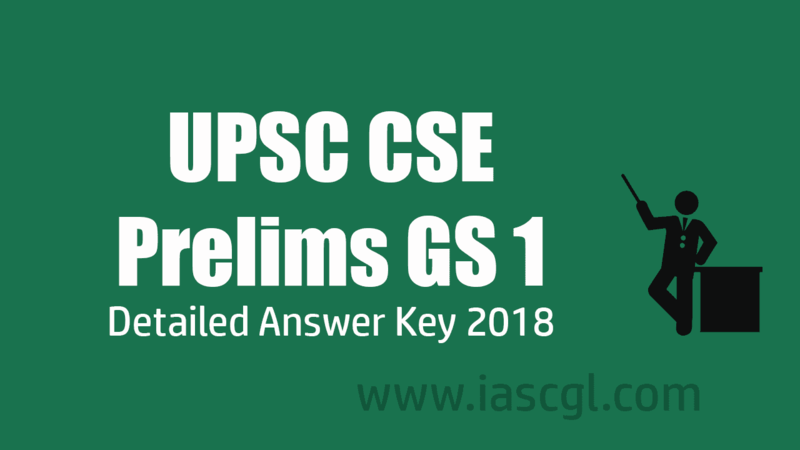 Here, we are providing the UPSC CSE Prelims Answer Key 2018 for GS Paper 1 with detailed explanations for the aspirants. This will help candidate and aspirant to check their score. 1. In the first Lok Sabha, the single largest party in the opposition was the Swatantra Party. 3. In the Lok Sabha, if a party does not have a minimum of 75 members, its leader cannot be recognized as the Leader of the Opposition. Exp: 1952 elections The Congress had won 364 out of 489 Lok Sabha seats in the first-ever general election held in India. Its vote share was 45 per cent. The CPI was the second party with just 16 seats. Leader of opposition was recognized for the first time in 1969. 2. Which of the following leaf modifications occur(s) in the desert areas to inhibit water loss? Exp-"The vegetation of hot desert climate is xerophytic type which has special characteristics to withstand very high rate of evaporation. They have long roots, thick barks, waxy leaves, thorns and little leaves." The share of OBC households among rural households is about 45 percent. In Kerala, about 61 percent agricultural families have more income from agricultural sources. 2. The NGT provides environmental justice and helps reduce the burden of litigation in the higher courts whereas the CPCB promotes cleanliness of streams and wells, and aims to improve the quality of air in the country. Exp: The Central Pollution Control Board (CPCB), is statutory organisation, was constituted in September, 1974 under the Water (Prevention and Control of Pollution) Act, 1974. It is also the statutory body. 1. The Parliament of India can place a particular law in the Ninth Schedule of the Constitutions of India. Exp: In a landmark ruling on 11 January 2007, the Supreme Court of India ruled that all laws (including those in the Ninth Schedule) would be open to Judicial Review if they violated the basic structure of the constitution. 6. Which one of the following best describes the term "Merchant Discount Rate" sometimes seen in news? (c) The charge to a merchant by a bank for accepting payments from his customers through the bank’s debit cards. (d) The incentive given by the Government to merchants for promoting digital payments by their customers through Point of Sale (PoS) machines and debit cards. Exp: Merchant discount rate on debit cards is the amount that a merchant has to pay to its service providers when a consumer swipes her card on the merchant’s point-of-sales terminal. It is also applicable for online transactions and QR-based transactions. The amount that the merchant pays for every transaction gets distributed among three stakeholders—the bank that enable the transaction, the vendor that installs the PoS machine and the card network provider such as Visa or MasterCard. 7. What is/are the consequence/consequences of a country becoming the member of the ‘Nuclear Suppliers Groups’? Exp: NSG membership also means India can begin to commercially produce nuclear power equipment, which it can then even sell to other countries. With access to state-of-the-art nuclear technologies, it can maximize its production benefits. NSG member will not automatically becomes a member of "The Treaty on the Non-Proliferation of Nuclear Weapons (NPT)". 8. With reference to India’s decision to levy an equalization tax of 6% on online advertisement services offered by non-resident entities, which of the following statements is/are correct? 1. It is introduced as a part of the Income Tax Act. Exp: The levy was introduced in the Budget as part of the finance bill and not as a part of Income Tax Act. So, because of this the companies would not be able to take the benefit of tax treaties to avoid double taxation in their home countries. It provides that income of the non resident from provision of the specified services to the assessee under chapter VIII of the FA is exempt from income tax in the hands of the non resident if the same is chargeable to equalization levy. However, it does not mean that the income of the non resident from the specified services would be charged to income tax if the same is not chargeable to equalization levy. 1. The Fiscal Responsibility and Budget Management (FRBM) Review Committee Report has recommended a debt to GDP ratio of 60% for the general (combined) government by 2023, comprising 40% for the Central Government and 20% for the State Governments. 2. The Central Government has domestic liabilities of 21% of GDP as compared to that of 49% of GDP of the State Governments. 3. As per the Constitution of India, it is mandatory for a State to take the Central Government’s consent for raising any loan if the former owes any outstanding liabilities to the latter. The combined debt-to-GDP ratio of the centre and states should be brought down to 60 per cent by 2023 (comprising of 40 per cent for the Centre and 20% for states) as against the existing 49.4 per cent, and 21 per cent respectively. Statement 3 is correct as per article 293 of the constitution. 1. The quantity of imported edible oils is more than the domestic production of edible oils in the last five years. 2. The government does not impose any customs duty on all the imported edible oils as a special case. Exp: Calcutta High Court ruled that Aadhaar Card is not a proof of citizenship and stated that "Aadhaar Card by itself shall not confer any right of or be proof of citizenship or domicile in respect of the holder thereto" while rejecting a claim of citizenship of the accused who was issued the card in view of his long residence in the country. The Aadhaar Act regulations, which are currently in Parliament, state that an individual’s Aadhaar number may be "omitted" permanently or deactivated temporarily by the Unique Identification Authority of India, the agency responsible for issuing the numbers and managing the database. The regulations give the Authority the power to deactivate Aadhaar numbers even in the absence of an effective grievance redressal procedure for those whose numbers have been suspended. 13. Which of the following has/have shrunk immensely/dried up in the recent past due to human activities? 14. "Rule of Law Index" is released by which of the following? Exp: The World Justice Project Rule of Law Index® measures rule of law adherence in 113 countries and jurisdictions worldwide based on more than 110,000 household and 3,000 expert surveys. Featuring primary data, the WJP Rule of Law Index measures countries’ rule of law performance across eight factors: Constraints on Government Powers, Absence of Corruption, Open Government, Fundamental Rights, Order and Security, Regulatory Enforcement, Civil Justice, and Criminal Justice. 55. Which one of the following links all the ATMs in India? Exp: National Financial Switch (NFS) is the largest network of shared automated teller machines (ATMs) in India. It was designed, developed and deployed by the Institute for Development and Research in Banking Technology (IDRBT) in 2004, with the goal of inter-connecting the ATMs in the country and facilitating convenience banking. It is run by the National Payments Corporation of India(NPCI). 16. Regarding Money Bill, which of the following statements in not correct? (a) A bill shall be deemed to be a Money Bill if it contains only provisions relating to imposition, abolition, remission, alteration or regulation of any tax. (c) A Money Bill is concerned with the appropriation of moneys out of the contingency fund of India. (d) A Money Bill deals with the regulation of borrowing of money or giving any guarantee by the government of India. 17. With reference to the election of the president of India, consider the following statements. 2. The value of the vote of MPs of the Lok Sabha is more than the value of the vote of KPs of the Rajya Sabha. a) Art. 55 provides for uniformity in the scale of representation of different states at the election of the President. b) Besides, there should also be parity between the states as a whole and the union. The number of MPs in Lok Sabha are higher so value of vote is larger than Rajya Sabha. Question has asked MPs not MP. 18. In the context, what is the implication of ratifying the ‘Additional protocol’ with the international Atomic Energy Agency (IAEA)’? (c) The country will have the privilege to but uranium from the Nuclear Suppliers Group (NSG). Exp: The Additional Protocol is not a stand-alone agreement, but rather a protocol to a safeguards agreement that provides additional tools for verification. In particular, it significantly increases the IAEA’s ability to verify the peaceful use of all nuclear material in States with comprehensive safeguards agreements. 19. Consider the following countries. Which of the above are among the ‘free-trade partners’ of ASEAN? Exp: ASEAN has existing free trade agreements with Australia, China, India, Japan, South Korea and New Zealand. 20. With reference to the ‘Global Alliance for Climate-Smart Agriculture (GACSA)’, which of the following statements is/are correct? Exp: The Global Alliance for Climate-Smart Agriculture (GACSA), was launched on 23 September 2014 at the UN Climate Summit. GACSA is an independent alliance, governed by its members through a Strategic Committee and its co-Chairs. Since the 1 January FAO is hosting the Facilitation Unit of GACSA with is supported through a multi donor trust fund. GACSA is a voluntary alliance of partners, dedicated to addressing the challenges facing food security and agriculture under a changing climate. In particular the alliance has the objective of up scaling the climate smart agriculture approach, a concept which was originally developed by FAO. GACSA’s ambitious future is based upon supporting and inspiring action. Farmers, fishers, foresters, and ranchers are at the center of this action, and therefore GACSA is devoting its Annual Forum to showcasing climate-smart agriculture in action. The Forum will be a dynamic gathering, where the participants share solutions, discuss challenges, and build partnerships on climate-smart agriculture. We are seeking out action-oriented stakeholders to come to both share and learn at the GACSA Annual Forum. 21. Which of the following is/are the aim/aims of "Digital India" plan of the Government of India? 1. Formation of India’s own Internet companies like china did. 2. Established a policy framework to encourage overseas multinational corporations that collect big data to build their large data centers within our national geographical boundaries. 3. Connect many of our villages to the internet and bring Wi-Fi to many of our schools, public places and major tourist centers. Exp: The residuary power, however, were not allocated either to the Federation or to the Provinces but was under Section 105 of the Government of India, 1935, reserved to be allocated by the Governor-General in his discretion to the Federation or to the Provinces. 2. Whenever the legislative assembly is dissolved, the speaker shall vacate his/her office immediately. 3. if he is removed by a resolution passed by a majority of all the then members of the assembly. Such a resolution can be moved only after giving 14 days advance notice. Whenever the Assembly is dissolved, the Speaker does not vacate his office and continues till the newly- elected member meets. 25. Which one of the following reflects the most appropriate relationship between law and liberty? (a) It there are more laws, there is less liberty. Exp: It was a statement by John Locke and also endorsed by Leviathan theory Thomas Hobbes. 1. No criminal proceedings shall be instituted against the Governor of a State in any court during his term of office. 2. The emoluments and allowance of the Governor of a State shall not be diminished during his term of office. Exp: Like the President, the governor is also entitled to a number of privileges and immunities. He enjoys personal immunity from legal liability for his official acts. During his term of office, he is immune from any criminal proceedings, even in respect of his personal acts. 1. The executive authority of the Centre extends (a) to directing any state to observe such canons of financial propriety as are specified by it; and (b) to directions as the President may deem necessary and adequate for the purpose. 2. Any such direction may include a provision requiring (a) the reduction of salaries and allowances of all or any class of persons serving in the state; and (b) the reservation of all money bills or other financial bills for the consideration of the President after they are passed by the legislature of the state. 3. The President may issue directions for the reduction of salaries and allowances of (a) all or any class of persons serving the Union; and (b) the judges of the Supreme Court and the high court. Exp: Bani Thani is an India miniature painting painted by Nihâl Chand from the Marwar school of Kishangarh. It portrays a woman who is elegant and graceful. The painting’s subject, Bani Thani, was a singer and poet in Kishangarh in the time of king Sawant Singh (1748–1764). She has been compared to the Mona Lisa. 28. What is "Terminal High Altitude Area Defense (THAAD)" sometimes seen in the news? (b) India’s indigenous anti missile Programme. Exp: Terminal High Altitude Area Defense (THAAD), formerly Theater High Altitude Area Defense, is an American anti-ballistic missile defense system designed to shoot down short-, medium-, and intermediate-range ballistic missiles in their terminal phase (descent or reentry) by intercepting with a hit-to-kill approach. Exp: Tyagaraja composed thousands of devotional compositions, most in Telugu and in praise of Lord Rama many of which remain popular today. Of special mention are five of his compositions called the Pancharatna Kritis which are often sung in programs in his honour. Annamayya (22 May 1408 – 4 April 1503) was a 15th-century Hindu saint and is the earliest known Indian musician to compose songs called sankirtanas in praise of the god Venkateswara, a form of Vishnu. 30. Which of the following are regarded as the main features of the "Rule of Law"? Exp: The Rule of Law identified eight principles to define it. 1. The law must be accessible and predictable. 2. Questions of legal rights should be resolved by the law and not the exercise of discretion. 3. The law should apply equally to all, except where objective differences justify differentiation. 4. Ministers must act within their powers and not exceed their limits. 5. The law must afford adequate protection of fundamental human rights. 31. With reference to the Indian Regional Navigation Satellite System (IRNSS), consider the following statements. 1. IRNSS has three satellites in geostationary and four satellites in geosynchronous orbits. 2. IRNSS covers entire India and about 5500 sq. km beyond its borders. 3. India will have its own satellite navigation system with full global coverage by the middle of 2019. Exp: ISRO opted for seven satellites — three in geostationary and four (as two pairs) in geosynchronous orbits — to provide the best navigation services. India has an independent regional navigation satellite capability that covers the entire country and an area extending about 1,500 sq. km beyond its border, with a position accuracy better than 20m in all weather conditions. The satellite is also working. 1. Light is affected by gravity. 2. The universe is constantly expanding. 3. Matter warps its surrounding space-time. Which of the above is/are the prediction/predictions of Albert Einstein’s General Theory of Relativity, often discussed in media? Exp: Einstein’s general theory of relativity is based on how we think gravity governs the behaviour of the Universe. We know that matter in the Universe warps the surrounding fabric of spacetime, and this warping effect is what we refer to as gravity. According to Einstein’s theory, light, just like any other form of matter, is affected by gravity. That is, light also “falls” in a gravitational field. Just as a comet’s trajectory is deflected by the sun when it passes nearby, a ray of starlight grazing the sun would also be deflected or bent. When we (or our camera) look at the star, we presume that the path taken by the light is straight. The effect of the bending of the light, then, is to make the star appear to be located in a slightly different position in the sky. 1. GM mustard has the genes of a soil bacterium that give the plant the property of pest-resistance to a wide variety of pests. 2. GM mustard has the genes that allow the plant cross-pollination and hybridization. 3. GM mustard has been developed jointly by the IARI and Punjab Agricultural University. Which of the statements give above is/are correct? Exp: DMH-11 is a Genetically Modified (GM) mustard hybrid. Hybrids are normally obtained by crossing 2 genetically diverse plants from the same species. The 1st-generation offspring resulting from it has higher yields than what either of the parents is individually capable of giving. But there is no natural hybridization system in mustard, unlike in, say, cotton, maize or tomato. This is because its flowers contain both the female (pistil) and male (stamen) reproductive organs, making the plant naturally self-pollinating. Exp: The Belle II experiment is a particle physics experiment designed to study the properties of B mesons (heavy particles containing a bottom quark). CRISPR – Cas9 is related to biotechnology. 35. Which of the following statement best describes "carbon fertilization? 36. When the alarm of your smartphone rings in the morning, you wake up and tap it to stop the alarm which causes your geyser to be switched on automatically. The smart mirror in your bathroom shows the day’s weather and also indicates the level of water in your overhead tank. After you take some groceries from your refrigerator for making breakfast, it recognizes the shortage of stock in it and places an order for the supply of fresh grocery items. When you step out of your house and lock the door, all lights, fans, geysers and AC machines get switched off automatically. On your way to office, your car warns you about traffic congestion ahead and suggests an alternative route, and if yourare late for a meeting, it sends a message to your office accordingly. In the context of emerging communication technologies, which one of the following terms best applies to the above scenario? 1. India is the third largest in the world in the manufacture of silicon waters used in photovoltaic units. 39. Which one of the following is a very significant aspect of the Champaran Satyagraha? 40. Who among the following were the founders of the "Hind Mazdoor Sabha" established in 1948? Exp: After Bhadrabahu, the Jainism split into Digambara and Svetambara. The Digambara belong to the lineage of Acharya Vishakha and Shvetambar follow the tradition of Acharya Sthulabhadra. In around 1500 AD, the Swetambar sect divided into three sub-sects known as Swetambar Murtipujak, Sthanakvasi, and Terapanthi. 1. White marble was used in making Buland Darwaza and Khankah at Fatehpur Sikr. 2. Red sandstone and marble were used in making Bara Imambara and Rumi Darwaza at Lucknow. Whereas Imambara instead of stones and marble, brick and lime were used. Stucco ornamentation (gajkari) was used to decorate the monuments, giving it a deep relief effect even on flat walls. Exp: Jean-Baptiste Tavernier (1605 – 1689)was a 17th-century French gem merchant and traveler.Tavernier, a private individual and merchant traveling at his own expense, covered, by his own account, 60,000 leagues (120,000 miles[clarification needed]) in making six voyages to Persia and India between the years 1630 and 1668. 44. With reference to India history, who among the following is future Buddha, yet to come to save the world? In the world of Buddhist eschatology, Maitreya literally means the future Buddha. Maitreya Buddha is considered as the 5th Buddha that is believed to appear in this Kalpa or era. Thus, Maitreya Buddha is considered as the Future Buddha that is yet to appear in this age. In various Buddhist sutra such as Amitabha Sutra, as well as Lotus Sutra, Maitreya Buddha is believed to be called as Ajita. According to Buddhist history and tradition, Maitreya Buddha is believed to be Bodhisattva who will appear in the Earth in the future, will achieve Nirvana and will teach the people of Earth the pure Dharma just like Shakyamuni Buddha did. According to the Buddhist texts as well scriptures, Maitreya Buddha will be considered as the successor of the living Buddha i.e. Gautama Buddha. The Prophecy of Maitreya Buddha coming back to the terrestrial world is written in most of the major Schools of Buddhism in many Buddhist countries. 45. Which one of the following statements does not apply to the system of Subsidiary Alliance introduced by Lord Wellesley? (iii) The security of the dominion of a prince who would enter into Subsidiary Alliance would be the responsibility of the English but the expenses of forces that the latter would maintain for the purpose had to be borne by the prince for which adequate area of his dominion had to be surren­dered to the English. 1. Capital Adequacy Ratio (CAR) is the amount that banks have to maintain in the form of their own funds to offset any loss that banks incur if the account-holders fail to repay dues. Exp: CAR is not decided by each individual bank but by RBI on the basis of Basel Committee recommendations. 47. The identity platform ‘Aadhaar’ provides open "Application Programming Interfaces (APIs)". What does it imply? 1. It can be integrated into any electronic device. 48. Very recently, in which of the following countries have lakhs of people either suffered from severe famine/acute malnutrition or died due to starvation caused by war/ethnic conflicts? 49. Regarding Wood’s Dispatch, which of the following statements are true? 2. Establishment of universities was recommended. • An education department was to be established in every province. • Universities on the model of the London University are established in big cities such as Bombay, Calcutta and Madras. • At least one Government school is opened in every district. • Affiliated private schools should be given grant-in-aid. • The Indian natives should be given training in their mother-tongue also. • In accordance with the Wood’s despatch, Education Departments were established in every province and universities were opened at Calcutta, Bombay and Madras in 1857 A.D.-and in Punjab in 1882 A.D. and at Allahabad in 1887 A.D.
.The medium of instruction at the primary level was to be vernacular while at the higher levels it would be English. 50. With reference to the Parliament of India which of the following Parliamentary Committees scrutinizes and reports to the House whether the powers to make regulations, rules, sub-rules, by-laws, etc. conferred by the Constitution or delegated by the Parliament are being properly exercised by the Executive within the scope of such delegation? Exp: Every house of the parliament has a Committee on subordinate legislation whose main function is to examine the rules and regulations enacted by the executive to fill the gaps in the laws enacted by the parliament and report how far these rules are within limits prescribed in the main law. This committee has 15 members each in Rajya Sabha and Lok Sabha. 1. As per the Right to Education (RTE) Act, to be eligible for appointment as a teacher in a State, a person would be required to posses the minimum qualification laid down by the concerned State council of Teacher Education. 2. As per the RTE Act, for teaching primary classes, a candidate is required to pass a Teacher Eligibility Test conducted in accordance with the National Council of Teacher Education Guidelines. 3. In India, more than 90% of teacher education institutions are directly under the State Governments. Exp: Eligibility conditions of teachers are determined by the National Council for Teacher Education. Exp: Thang Ta – is an ancient Manipuri Martial Art developed from the war environment of Manipur created by the Meitei. Thang Ta was also known as Huyen Lallong which means the art of sword and the spear. 1. The food Safety and Standard Act, 2006 replaced the Prevention of Food Adulteration Act, 1954. 2. The Food Safety and Standards Authority of India (FSSAI) is under the charge of Director General of Health Services in the Union Ministry of Health and Family Welfare. Exp: The FSS Act is a bucket for all the older laws, rules and regulations for food safety. The FSS Act took 8 older acts into one umbrella. Food Safety and Standards Authority of India (FSSAI) is an autonomous body established under the Ministry of Health, Family Welfare, Government of India. The FSSAI has been established under the Food Safety and Standards Act, 2006 which is a consolidating statute related to food safety and regulation in India. FSSAI is responsible for protecting and promoting public health through the regulation and supervision of food safety. Exp: Two state solution is the preferred solution adopted for the Arab-Israel conflict by creation of states of Israel and Palestine. 2. The eldest woman in a household, of age 18 years or above, shall be the head of the Household for the purpose of issuance of a ratio card. 3. Pregnant women and lactating mothers are entitled to a ‘take-home ration’ of 1600 calories per day during pregnancy and for six months thereafter. • Households covered under the Targeted Public Distribution System (TPDS) are entitled to five kilograms of foodgrains per person per month at subsidised prices. • Households covered under Antyodaya Anna Yojana (AAY) scheme continue to be entitled to 35 kilograms per household per month, as AAY households constitute the poorest of the poor. • Foodgrains that come under the TPDS will be available at the subsidised price of Rs. 3 per kilogram for rice, Rs. 2 per kilogram for wheat, and Re. 1 per kilogram for coarse grains or at a price fixed by the central government three years after the Act. • Each state will identify eligible households for coverage under the TPDS. The list of eligible households will be placed in the public domain and displayed prominently. • Pregnant women and young mothers are entitled to receive meals free of charge through the local childcare centre set up under the Integrated Child Development Services (ICDS) scheme. They are also entitled to receive maternity benefits of not less than Rs. 6,000 in instalments prescribed by the central government. • Children aged 6 months to 6 years are entitled to age-appropriate meals free of charge through the local childcare centre set up under the ICDS. • Children aged 6 to 14 years are entitled to one free midday meal everyday (except holidays) in government-aided schools and those run by local bodies. • If foodgrains and meals are not supplied, entitled persons will receive a food security allowance from their state government. • The oldest woman of the family (who must be at least 18 years of age) will be considered the head of the household when ration cards are being issued. • Every state government must set up an internal grievance redress mechanism, which may include call centres, helplines and the designation of nodal officers. • State governments must also appoint a District Grievance Redressal Officer for each district. This officer must enforce the Act and address the grievances of those who have been denied entitlements under the law. • If any public sector employee or authority fails to provide the relief recommended by the District Grievance Redressal Officer, he or she will be fined a penalty of not more Rs. 5,000. Exp: under the Uruguay and Singapore round agreement, the creation of TRIPS agreement and its expansion has brought the following under WTO rulings. Thus the 1999 act for protection of GI was formed. 1. In India, State Governments do not have the power to auction non-coal mines. 2. Andhra Pradesh and Jharkhand do not have gold mines. 3. Rajasthan has iron ore mines. Exp: State governments have the power to auction non-coal mines. Jharkhand and Andhra Pradesh have two of the three active gold mines. Bhilwara in Rajasthan has an iron ore mine. 1. BHIM app allows the user to transfer money to anyone with a UPI enabled bank account. 2. While a chip-pin debit card has four factors of authentication, BHIM app has only two factors of authentication. Exp: The BHIM apps has three levels of authentication. For one, the app binds with a device’s ID and mobile number, second a user needs to sync whichever bank account (UPI or non-UPI enabled) in order to the conduct transaction. Third, when a user sets up the app they are asked to create a pin which is needed to log into the app. Further, the UPI pin, which a user creates with their bank account is needed to go through with the transaction. 59. Among the following cities, which one lies on a longitude closest to that of Delhi? Exp: The Union Cabinet has given its approval for ratification of the two fundamental conventions of the International Labour Organization namely, Minimum Age Convention (No 138) concerning minimum age for admission to employment and the Worst Forms of Child Labour Convention (No 182) concerning the prohibition and immediate action for elimination of the worst forms of Child Labour. India is a founder member of the International Labour Organization (ILO), which came into existence in 1919. At present, the ILO has 187 members. The principal means of action in the ILO is the setting up of International standards in the form of Conventions, Recommendations and Protocol. India has so far ratified 45 Conventions, out of which 42 are in force. Out of these 4 are Fundamental or Core Conventions. 61. Which of the following led to the introduction of English Education in India? 62. Which one of the following is an artificial lake? 64. In 1920, which of the following changed its name to "Swarajya Sabha"? 65. Which among the following events happened earliest? 66. Which of the following is/are the possible consequence/s of heavy sand mining in riverbeds? Hydrogen sulphide rapidly oxidizes to gases that dissolve in water to form sulphurous and sulphuric acids. These compounds contribute in large part to the "acid rain" that can kill sensitive aquatic organisms and damage marble monuments and stone buildings. 69. "3D printing" has applications in which of the following? 71. Why is a called Prosopis julifloru often mentioned is news? 76. Which one of the following statements correctly describes the meaning of legal tender money? 79. Consider the following statements. 81. After the Santhal uprising subsided, what was/were the measure/measures taken by the colonial government? 85. In which of the following areas can GPS technology be used? 89. With reference to the circumstances in India agriculture, the concept of "Conservation Agriculture" assumes significance. Which of the following fall under the Conservation Agriculture? 92. Right to Privacy is protected as an intrinsic part of Right to Life and Personal Liberty. Which of the following in the Constitution of India correctly and appropriately imply the above statements? 94. In which one of the following States in Pakhui Wildlife Sanctuary located? Exp: After the Securitisation and Reconstruction of Financial Assets and Enforcement of Securities Interest Act, 2002 (also known as the SARFAESI Act) ,the government capital infusion steadily decreased until NPA problem introduced in 2015. Exp: The Critical Wildlife Habitats have been envisaged in Scheduled Tribes and Other Traditional Forest Dwellers (Recognition of Forest Rights) Act, 2006. In a bid to undo historical injustice meted out to primitive tribal communities living in central India, the government of Madhya Pradesh has for the first time recognised the habitat rights of seven villages in Dindori district, mostly inhabited by the Baiga.Gram panchayats decide Habitat Rights for Primitive and Vulnerable. Exp: Plant diseases can be infectious (transmitted from plant to plant) or noninfectious. Common plant disorders are caused by deficiencies in plant nutrients, by waterlogged or polluted soil, and by polluted air. Too little (or too much) water or improper nutrition can cause plants to grow poorly. Plants can also be stressed by weather that is too hot or too cold, by too little or too much light, and by heavy winds. Pollution from automobiles and industry, and the excessive application of herbicides (for weed control) can also cause noninfectious plant disorders. 1. ‘The National Programme for Organic Production’ (NPOP) is operated under the guidelines and directions of the Union Ministry of Rural Development. 2. ‘The Agricultural and Processed Food Products Export Development Authority’ (APEDA) functions as the Secretariat for the implementation of NPOP. 3. Sikkim has become India’s first fully organic State. Exp: Ministry of Commerce has implemented the National Programme for Organic Production (NPOP) since 2001. The testing is to be carried out in ISO 17025 accredited and preferably APEDA approved laboratories. Sikkim has become India’s first fully organic state by implementing organic practices on around 75,000 hectares of agricultural land.